Following the dramatic destruction of Army Group Centre and overshadowed by Koniev's and Zhukov's rush on Berlin, this particular theatre of operations in Hungary, 1944-45, including the devastating Siege of Budapest, which was one of the bloodiest sieges of the war, has been substantially overlooked by most historians. Unfortunately, due to sales rights restrictions, we cannot offer Hungary 1944-1945 for sale in your country. Following the dramatic destruction of Army Group Centre and overshadowed by Koniev’s and Zhukov’s rush on Berlin, this particular theatre of operations in Hungary, 1944-45, including the devastating Siege of Budapest, which was one of the bloodiest sieges of the war, has been substantially overlooked by most historians. 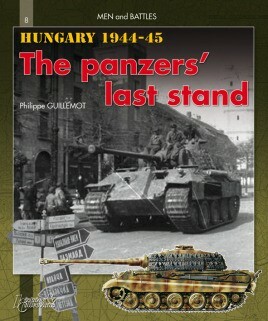 This fully detailed, highly illustrated monograph is a key opportunity to chronicle the full events of these clashes between the Red Army and German and Hungarian troops - whose last convulsions only one month and three weeks before the German capitulation at Reims were definitely the Panzer’s last lunge at the enemy. ...definitely recommended as a good summary of this important, but little known, chapter of World War II.